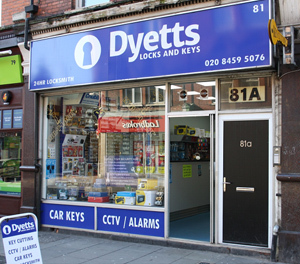 Dyetts has been trading in Willesden High Road since 1954. The shop has recently undergone a complete refurbishment, allowing us to offer modern methods but still keeping our traditional values. We have an extensive range of over 2500 types of keys that we are able to cut while you wait. This includes house keys, security keys, car keys and safe keys. We are the largest stockist of classic car keys in London. At Dyetts, we are able to help with any locksmith emergency you may have 24/7. We do lock repair, unlocking of doors, locks replacement and boarding up of doors and windows. Our experienced engineers are trustworthy, professional and reliable.